6/8/2007 / By Dylan / In: Rough Drafts / Comments Off on Space Cowboys and the Steampunk Treehouse. One of the best discoveries I made at the Yuri’s Night party at NASA Ames a couple months ago was the Space Cowboys, a group of people with a modified Mercedes-Benz Unimog — it looks like a military vehicle — that they’ve turned into a self-contained, mobile, fully street-legal dance machine. 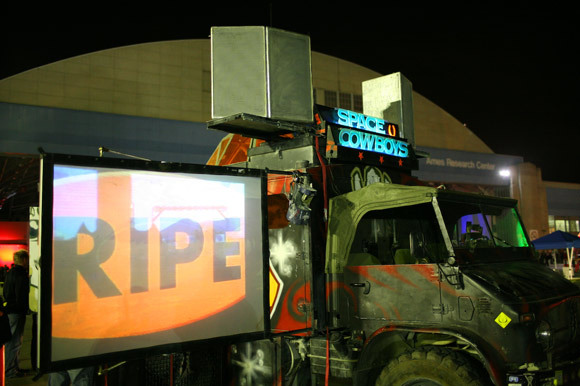 Once parked, projection panels swing out from the sides, an array of big speakers get unloaded, a DJ climbs inside, and the music starts pumping. It’s an amazing thing to see and had me totally transfixed once it came to life. With Burning Man coming up at the end of the summer the Unimog seems to be popping up at one fundraiser after another, but one, scheduled for 8pm to 2am in Oakland on Saturday, June 9, looks pretty damn cool: It’s a party to raise money for the “Steampunk Treehouse”, a giant, metal, steam-huffing, fantasy Victorian tree in the spirit of the Neverwas Haul. In addition to the Unimog there will also be appearances by One Man Banjo, who does this kind of swamp funk Tom Waits-y banjo show, and what appear to be a bunch of fire arts performers, and no doubt a bunch of other cool stuff. Details at the Steampunk Treehouse site.